“The Secret Lives of Baba Segi’s Lives" is back on stage. Lola Shoneyin’s novel The Secret Lives of Baba Segi’s Lives returns to stage this June. This adapatation has been written by Rotimi Babatunde and is directed by Femi Elufowoju Jr. The Secret Lives of Baba Segi’s Wives is a scandalous, engrossing tale of sexual politics and family strife in modern-day Nigeria. Baba Segi has three wives, seven children, and a mansion filled with riches. But now he has his eyes on Bolanle, a young university graduate wise to life’s misfortunes. When Bolanle responds to Baba Segi’s advances, she unwittingly uncovers a secret which threatens to rock his patriarchal household to the core. Lola Shoneyin’s bestselling novel will return to stage with a vivid adaptation by Caine Prize winning playwright Rotimi Babatunde. Femi Elufowoju Jr directs a multi-talented West African ensemble in the UK premiere production, featuring live Yoruba music, songs and dance. This isn’t the first adaptation of The Secret Lives of Baba Segi’s Wives. It has been performed at the Ake Festival in the past as well as done as a one woman show by Maimouna Jallow on several occasions like here, here and here. In the latest run of the show Patrice Naiambana will star as Baba Segi in Arcola Theatre’s The Secret Lives of Baba Segi’s Wives. The cast also includes Jumoké Fashola (Inspirit, BBC Radio London’s Sunday Breakfast Show; Dirty Little Secrets, London Festival of Cabaret), Christina Oshunniyi (Ife, Queen Elizabeth Hall and Africa Center; One Session, First Star Studios), Layo-Christina Akinlude (The Taming of the Shrew, Shakespeare’s Globe; The Cane, Bush Theatre), and Marcy Dolapo Oni (Iya-Ile, Soho Theatre; The Marcy Project, OHTV) will appear as Baba Segi and his wives. This production will be performed in the round in the Arcola’s main space using an ensemble featuring actor-musicians led by Ayan De First and Usifu Jalloh. At times, the entire ensemble becomes an acoustic band with traditional instruments used including Omele drum, Gbedu drum, Fulani flute, thumb pianos, shekeres, Iya Ilu talking drums, djembes, and Apala drum. 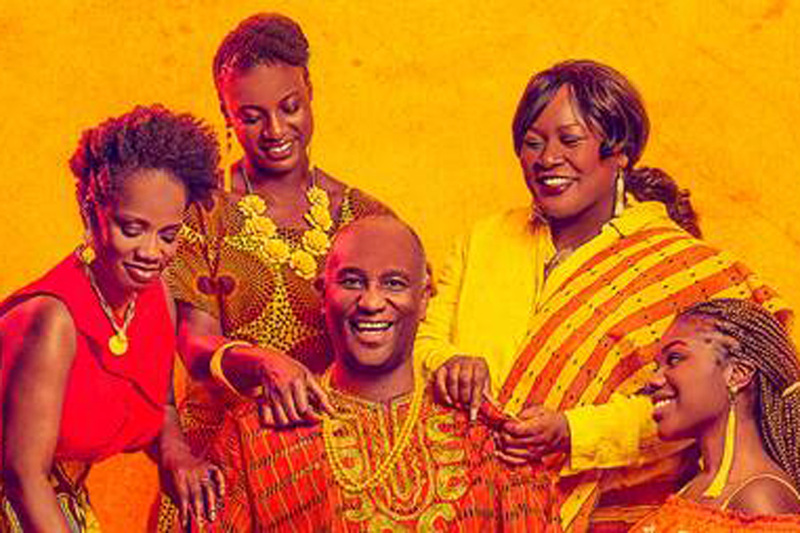 The Secret Lives of Baba Segi’s Wives will play at the Arcola Theatre, London, UK from June 7 to July 21 2018 and is suitable for ages 18+. Previous Previous post: Magunga Williams is Kenya’s Creative Writing Blog 2018 winner. Next Next post: Nnedi Okorafor’s Binti Trilogy new hardcover editions for July.